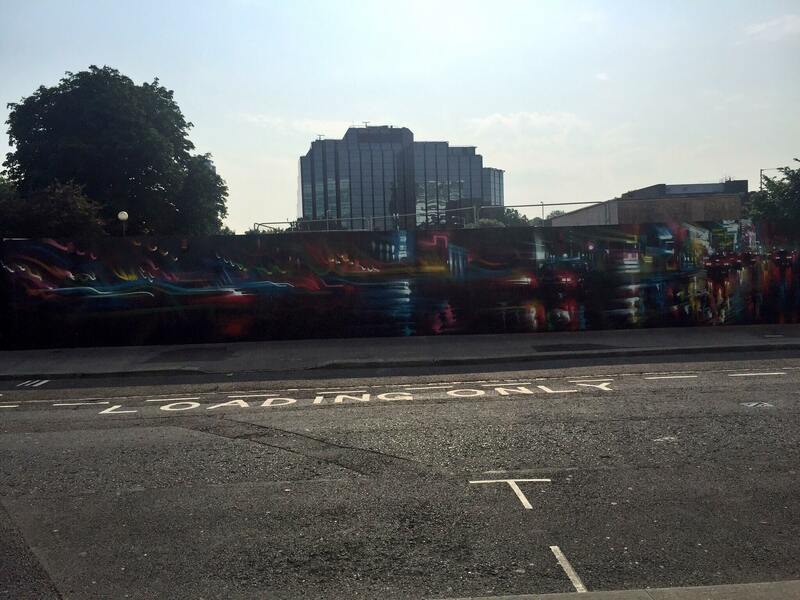 A new work has appeared yesterday courtesy of Dan Kitchener in preparation for the Pearl Izumi Tour Series return to Croydon which is a massive 136ft long a record wall space for Dan. This incredible work was completed in one day a task made not for the faint hearted. This is the latest in the Liquid Lights series which is not to far from the previous three works Dan has done in Croydon. See this incredible work while you can as it is on the legal wall opposite the Croydon council offices and we are not sure how long it will be there. Welcome back Dank long may your Liquid Lights series continue, your new mural was the perfect edition to the Pearl Izumi Tour Series cyclists speeding past! This artwork i have just seen on walls around Croydon is just out of this world.